The BCI Sunflower clinic in Myer Parramatta celebrates 10 years of screening with Greystanes resident Dierdre Ford, Westmead BCI strategic operatins director Susan Hamill and Myer sales manager Jessica Regan and store manager Elias El Zakhem. 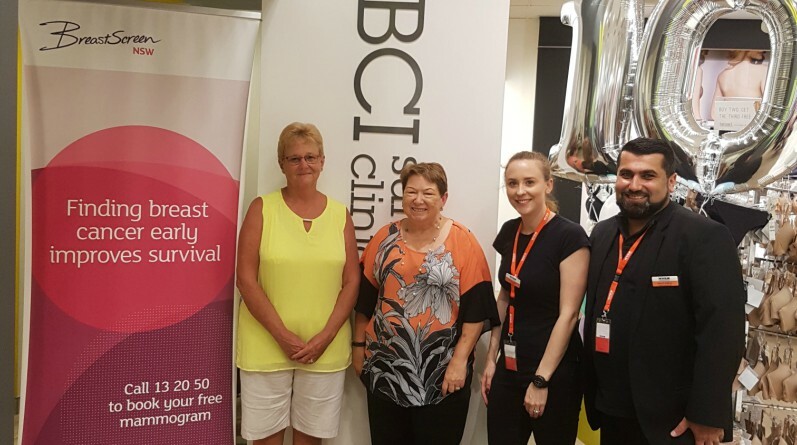 The Westmead Breast Cancer Institute (BCI) has achieved a significant milestone with its flagship BCI Sunflower Clinic celebrating a decade of breast screening in MYER Westfield Parramatta. The clinic, located on Level 2, is one of the most successful screening site for BreastScreen NSW. It’s located in a prominent position in MYER in the intimate apparel department which is convenient, free and open seven-day-a-week including Thursday evenings and weekend, providing breast screening mammograms to women aged 50-74 years. BreastScreen NSW aims to reduce deaths from breast cancer through early detection. BCI director Associate Professor Nirmala Pathmanathan said one in eight women will develop breast cancer in their lifetime. “It is essential for women particularly aged 50-74 to have a mammogram every two years,” Professor Pathmanathan said. “Parramatta is one of our most successful sites with its location and ability to book women on the spot for an appointment or if we can – test them that day. “On average we test more than 200 women each week and we can offer free interpreters. “It’s wonderful so many women have taken the time to undertake a 15 minute breast screen, which could potentially save their life. This message struck a chord with Greystanes resident Diedre Ford, 61, who had her first mammogram at the age of 40, following advice from her GP. “Every two years I have a mammogram, and what brings me back to the Myer clinic is the friendly staff and convenience of the clinic being central to my shopping and in the heart of Parramatta,” Mrs Ford said. In western Sydney there are six BCI Sunflower Clinics for BreastScreen NSW where women can have their free screening mammogram. This includes the MYER stores at Blacktown, Castle Hill, and Penrith, as well as hospital based clinics in Auburn, Blue Mountains and Mount Druitt. Regular mammograms with BreastScreen NSW is the most effective way of detecting breast cancer early, when more treatment options are available, and when chances of survival from this disease are the greatest. A GP referral is not required to make a FREE booking with BreastScreen NSW, women simply need to call 13 20 50 to make an appointment.